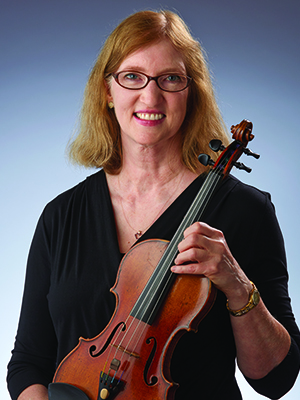 Barbara Fisher Agresti was born in Lima, Ohio, and received her violin training at the North Carolina School of the Arts, the University of New Mexico and Indiana University where she earned a M.M. degree. Her major teachers have included Vartan Manoogian, Leonard Felberg, Ruggiero Ricci and Franco Gulli. Before joining the Indianapolis Symphony Orchestra in 1975, she was a member of the Piedmont Chamber Orchestra and the Thouvenel String Quartet. Since arriving in Indianapolis, she has been active in chamber music performances with Suzuki & Friends, the Ronen Ensemble and the Cameo Trio. With the Orchestra, Ms. Agresti serves on the String Section Rotation Committee and has been an alternate member of the Orchestra Committee. She and her husband, ISO first violinist Gino Agresti, are the parents of two daughters. Ms. Agresti enjoys floral gardening and volunteering with her children’s activities.